Once upon a time, there was a man who cooked so well that a woman decided to marry him. And when he ran away, taking up a job as a cook, she tracked him down by the flavours he conjured up in his master’s kitchen. His name was Nala. Her name was Damayanti. A sage called Vrihadashwa narrates the story, Nalopakyana, or the tale of Nala, to the Pandavas, during their exile in the forest, in the epic Mahabharata. This makes it a story within a story. Nala loses his fortune due to his own foolishness and is so ashamed of himself that he runs away from his wife, and lives in hiding, until she finds him, and restores his faith in himself through her love. What is interesting is that Nala, a prince, who is an expert in chariot-riding, but terrible at the game of dice, is also a cook. This is an usual tale. Nala is described as a Nishadha, which could have many meanings including ‘tribal king’, and so may refer to someone outside the classical Aryan warrior mould. In the Mahabharata, Bhima is also described as a cook; but he cooks to feed himself (a negative trait that lands him in Naraka eventually). In the Virata Parva, when he is forced to hide as a servant in the kingdom of Matsya, he is required to feed others before he feeds himself. 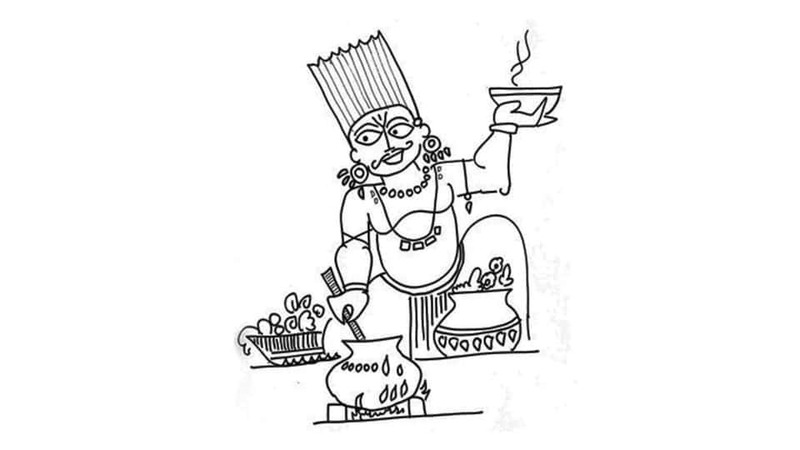 Cooks were service-providers, or dasa, hence belonging to the shudra varna. Hardly the vocation, or the hobby, of a king. Yet it is this hobby that wins him the heart of Damayanti. That is how she distinguishes him from the Gods who attend her swayam-vara: the flavours of the kitchen cling to him, while they exude the scent of flowers. READ ALSO What came first: The world or life? Women, who were expected to serve their husbands, are known to be cooks. Sita and Draupadi are famous as cooks and as hosts. Nala stands out as an exception. The male cook, or shall we say chef, the forerunner of the Maharaj who controls many a Marwari and Gujarati kitchen. He even wrote a book. Of course, we are not sure if this Sanskrit cookbook, which is at least 800 years old, was actually written by one Nala or simply attributed to him by a humble writer who knew marketing and did not want the glory. This book is called Paka-darpana or the mirror of culinary skills! Here, we have not only recipes but also observations about food, techniques of cooking and their medicinal properties, revealing an intimate knowledge of Ayurveda too with different types of food for different times of the day and different seasons. He also reveals knowledge of poisons: how ingredients that are non-toxic become toxic when mixed together, or how toxic ingredients become non-toxic when cooked differently. So we find dishes containing leaves of the poisonous dhatura and arka plants. He is also particular about the qualities of a cook and a waiter! Sixteen types of preparations are described: rice, khichdi, curd rice, ghee, butter, buttermilk, puddings, juices, meat dishes, vegetable dishes, watery dishes, side dishes, munchies, lickables, appetizers. Most interestingly, the book refers to indigenous biryani (mamsodana): rice cooked with meat. There are detailed descriptions of various preparations with flesh of birds including chicken (kukkuta), animals, fish and eggs. No crinkling of the nose at the sight of meat in this Sanskrit work.